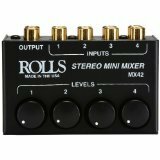 Jun 15, 2017: How is the rolls MX42 4 channel RCA mixer? Jul 08, 2017: Using one sub in two setups? Dec 19, 2017: Multiple inputs one headset? Jan 24, 2018: Sound Mixer Setup Question - Audio geniuses welcome! Jan 31, 2018: Mix 5.1 (optical) + Stereo Inputs? Feb 21, 2018: What is this type of connecter called? Apr 03, 2019: Does this exist?